You never cease to amaze me with your talent and humility. You are truly blessed and are a blessing with your gifts. Thank you for sharing and for teaching. Wow. 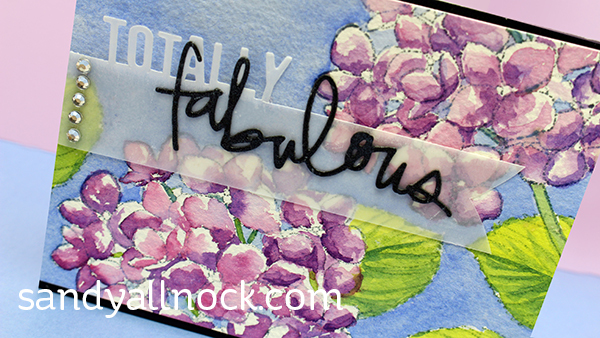 Your watercoloring adds a whole new dimension to the hydrangea stamps. Thanks for sharing your beautiful card. Love the hydrangea! Thanks for the video … I need to work on my watercoloring. What gorgeous hydrangeas you painted, Sandy! Amazing work. Fabulous lesson, beautiful card. I am “painting challenged” but your demo has encouraged me to give it a try. Wow! You did an amazing job with that Mondo Hydrangea! Beautiful. WOW wow WOW – your card is BEYOND TOTALLY FABULOUS Sandy!!! LOVE your hydrangeas, LOVE your design, LOVE IT ALL!!! Beautiful card! I want to frame it and hang it up as art! Loved your video on the watercoloring. This new stamp from Ellen looks like a “must have”. Love the hydrangea, and really, really enjoyed watching you water color it! What an amazing job on those hydrangeas! Such a beautiful card!! fantastic job on that hydrangea. Beautiful card as always Sandy! Your coloring is just fabulous! It is a truly fabulous watercolored card! I am in awe! Wow-beautiful! Thanks Sandy for sharing with us! Dear Sandy, To say your work inspires me is an understatement! I began following you just when I began teaching myself how to make homemade cards 2 years ago-and watched your You-Tube videos so closely-trying to teach myself how to utilize Copics, then I added watercolors-oh my what fun! I love making cards to cheer up “homebound” and those in the hospital. They are so grateful- its wonderful to bring a little “handmade” joy to them, and let them know -they are cared for. Thank you for daily inspiring me with your amazing gifts! Your videos encourage me-and undoubtedly encourage countless others! Thank you for missing sleep to help us learn! God bless you, Julieanne. Oh Sandy, your work is just beautiful!! Gorgeous card–and I love hydrangeas! YOUR WORK IS STUNNING AND LOVELY. Your tutorials are the best on the net.Thank you for being so generous with your techniques. Great card and a great release! Once again…..awesome job! 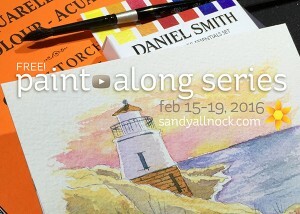 I love your beautiful watercolor effect card, Sandy! Just gorgeous! Beautifully painted flowers! thanks for sharing the process. Gorgeous painting of these flowers. Thanks for all the tips and how to decide on paintbrushes. already ordered the hydrangea – love how you’ve used it! I love the hydrangea set and the way you painted them. Thanks. This is so beautiful – and really love that stamp! This is mu fave one and you colored these Hydrangeas so beautifully, love it! Thanks for sharing you beautiful hydrangeas. You make painting them look so easy!! Beautiful, and I loved your tutorial. 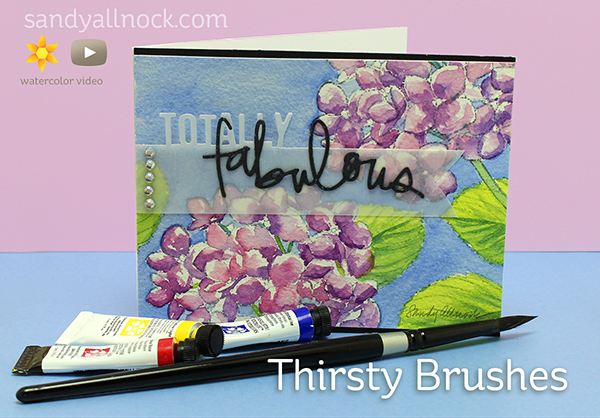 Love the Mondo Hydrangea set, love your beautiful watercoloring, and thanks for the video too! the hydrangea stamp set is so awesome and enjoyed your coloring video. . .
Hi Sandy ~ Hydrangeas are my absolute favorite (I have a yard full) and your painting is absolutely exquisite. Thanks so much for sharing your wonderful talent with the rest of us and encouraging us to take it to the next level. Hi Sandy! These Daniel Smith paints look fabulous with your hydrangea. Thanks for the great video! Great release and hop. Gorgeous flower blooms! Beautiful painting, as usual. Love your style and technique. Thanks! These hydrangeas really are fabulous! Makes me want to start water-coloring again…great video full of lots of helpful info. Your hydrangeas are so beautiful. This hydrangea Stamp is so pretty and I like the lifting you did! I love this beautiful stamp set and your painting takes it to another level! Gorgeous! !